This conversion lead allows a 240V site hook-up plug from a caravan, campervan, motorhome etc. to be connected to a standard 3-pin 240V UK mains socket. 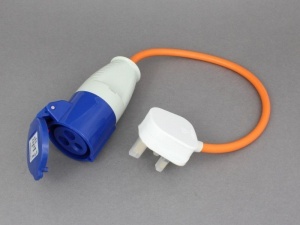 It comprises a site socket connected to a standard UK 3-pin plug via an orange 30cm lead. This is useful if you want to connect your campervan or motorhome electrics to the mains when at home (e.g. for charging leisure batteries via a mains charger). Wanted for 16a connection. Well made high quality item. A good quality product, allowing us to use as a commercial vehicle hook-up and fully suited to our needs.